Shades of fiery topaz are set ablaze in Swarovski’s meticulously cut crystal. Placed in a dynamic design and finished in antique copper, this set is truly “A Medley of Beauty” that you will enjoy for years to come. Drop earrings with adjustable clips and 16” neckpiece with 2” extension, set.Nickel and lead free. October's birthstone emits the exotic brilliance of all the colours of a beautiful rainbow and is recognized as an inspiration for true love. Shakespeare himself crowned the opal as the queen of gems. What could be more suited for"A Poetic Design" created by one of Fifth Avenue Collection's master craftsmen! Beautiful cascading filigree finished in 14k gold sets the stage for this lovely stone accompanied by a single multifaceted aurora borealis crystal by Swarovski.The beautiful craftsmanship is further displayed in the matching ring.Stud earrings with 14K gold posts and 24” Neckpiece with 2” extension. Fasten your seatbelt and get ready for the most exciting fashion ride of your life wearing this wild and wonderful neckpiece and earrings set. Globes of marbled blue agate, black agate pellets and rounds of natural obsidian, mix in an astonishing medley with Swarovski's copper crystal beads and faceted Venice clear glass. All beautifully placed on a popular black rolled rope fashioned with rich rhodium closures. Have a ball wearing this exceptionally beautiful jewellery - and yes, there is a matching bracelet!Sterling silver hook earrings.16” Neckpiece with 2” extension.Nickel and lead free. The glorious color and brilliance of Swarovski’s aurora borealis crystal and AAA quality cubic zirconia are intensified in this “Blazing Star” pin/pendant, as it drops from a delicate dual designer chain. Matching slender drop earrings in a multi-faceted diamond cut are magnificent. Stud earrings with 14K posts and 24” neckpiece with 2” extension, setNickel and lead free. 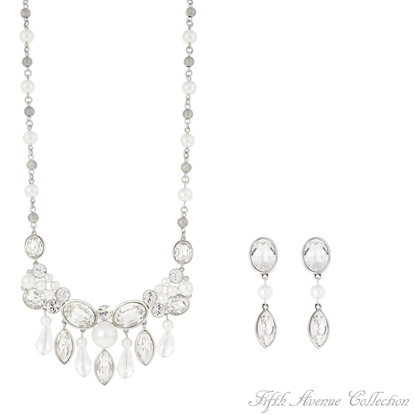 Brilliant spheres of Swarovski crystal beads the color of fine champagne sparkle like moonlight on a romantic evening as they drop gently from triple strands of complimenting light Colorado crystals set in a ruthenium finish. The matching drop earrings complete this magical look.Drop earrings with 14k posts and 15” neckpiece with 2” extension, set.Nickel and lead free. Here you go ladies… another sure to be classic – “Copper Blue”! 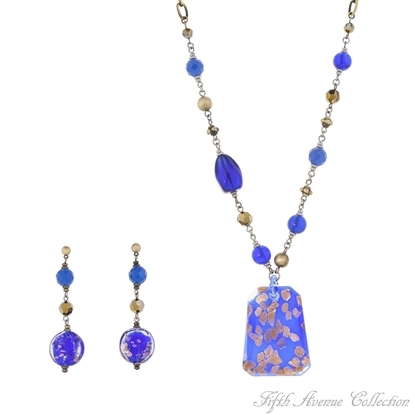 Beautiful Venetian glass baubles are delightful as they fall freely from an antique copper chain where they meet with a fabulous indigo blue pendant splashed with sparkling copper. Venetian glass - revered by the most discerning fashion coutures – is now reserved for you… the classiest woman in the world. The matching bracelet demands all the attention you deserve!Adjustable clip earrings and 16” Neckpiece with 2” extension, set.Nickel and lead free. This dramatic yet delicate design in a blackened finish is studded with dozens of Swarovski’s blazing clear crystals – making this glamorous jewellery an instant classic from the moment you clasp it on.Drop earrings with 14k posts and 16” neckpiece with 2” extension, setNickel and lead free. Black tear drop triple A cubic zirconias, perfectly placed amongst hundreds of fine gold beads “Delight The Eye” when paired with their delicate matching drop earrings. Sterling silver hook earrings. 17" Neckpiece with 2" extension or 19" Neckpiece with 2" extension. Nickel and lead free. Silvery smooth pendant and earrings are embellished with stunning gold motifs studded with Swarovski's clear crystals making them undeniably hot. Gems reminiscent of Tahitian pearls flow on bold twin chains that captures the essence of the exotic things that you anticipate when you are looking for the unusually beautiful in jewellery. Fifth Avenue Collection brings you fashionable designs that will wow them from “Dusk 'Til Dawn”.Sterling silver hook earrings or adjustable clips. 16” Neckpiece with 2” extension.Nickel and lead free. All beautiful chain leads to spectacular pendant.. like this gorgeous butterfly encrusted with Swarovski's aurora borealis crystals and lustrous pearls set in rich rhodium. 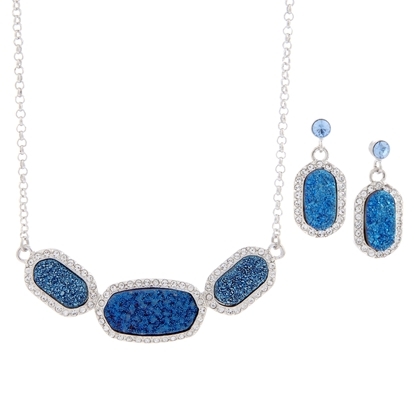 The matching drop earrings are equally as lovely. Sterling silver hook earrings. 16” Neckpiece with 2” extension.Nickel and lead free. Fifth Avenue Collection’s designers capture the splendor of the tiger butterfly in this unique and lovely jewellery. Venice glass in shades of silvery white, accented with black and spotted with jungle brown, was designed to take you on a fantasy ride. Tiny silver butterflies will turn an ordinary day into something special as you soar into the wonderful world of fashion.Earrings with sterling silver hooks or adjustable clips and 16” neckpiece with 2” extension, setNickel and lead free. “Hello Beautiful!”… that’s what you’ll be hearing when you wear this elegant rectangle jewellery featuring AAA quality cubic zirconia, magnificently placed in its simple yet luxurious design. Outstanding in of smoky quartz finished in gleaming gold. Earrings with 14K posts or adjustable clips and 16” neckpiece with 2” extension, set.Nickel and lead free. 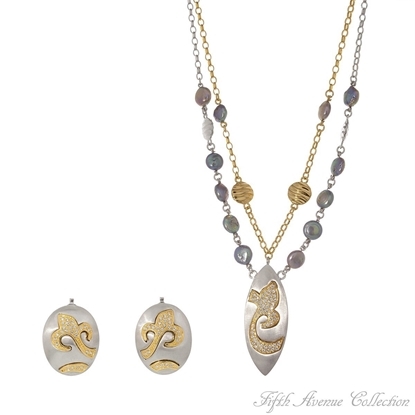 Natural agate from the earth and colorful abalone from the sea collaborate with Fifth Avenue Collection designers to bring this spectacular jewellery to life. Its understated twin chain and Swarovski's sparkling clear crystals help to create an illustrious legend in the art of fine fashion jewellery. 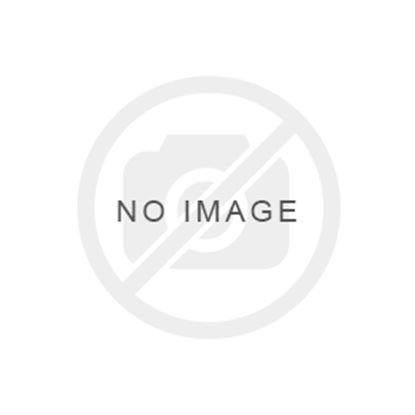 Sterling silver hook with 16” Neckpiece with 2” extension.Nickel and lead free. You’ve just won a “Jackpot!” of beauty when you treat yourself to this gorgeous jewellery that explodes with sumptuous crystal in the fantastic colors of amethyst, citrine, olivine and rose. 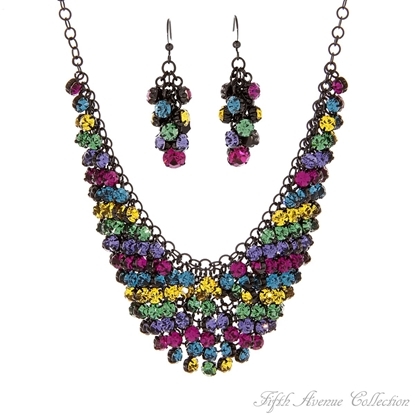 This amazing neckpiece and earring set finished in popular hematite is complete when you add the matching bracelet.Earrings with 14K posts or adjustable clips and 16” neckpiece with 2” extension, set.Nickel and lead free. 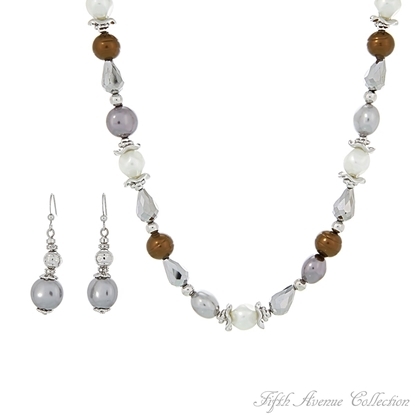 Could anything be more beautiful than the combination of Swarovski clear crystal and lustrous pearls set in this breathtaking design?Earrings with sterling silver posts and 18" neckpiece with 2" extension Nickel and Lead free. The eye catching combination of chocolate brown and brilliant clear AAA cubic zirconia make this irresistible color palette a must for this season’s home entertainment and party rounds alike. Its chocolate teardrops and clear rounds fall in perfect harmony as they meet with the blazing centerpiece of this stunning neckpiece. With certain, the matching earrings will leave a “Lasting Impression” of beauty and good taste.Earrings with 14k posts and 16” neckpiece with 2” extension, setNickel and lead free.